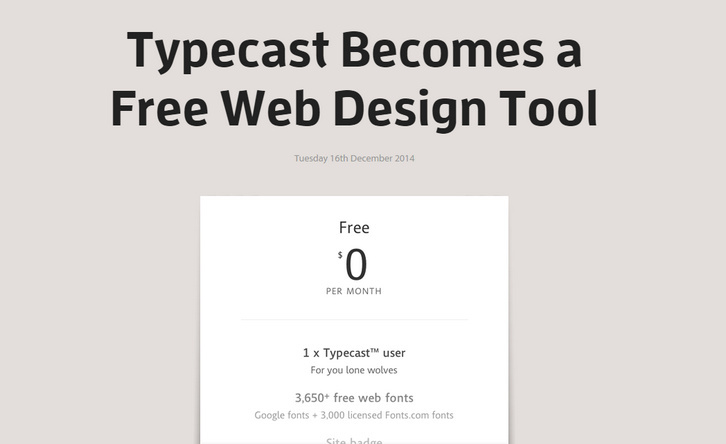 Typecast™ is now a free web design tool. It’s a good news for everyone who cares about web typography and wants to work with web fonts, everyone who wants to design pages instead of pictures, every designer who wants to test rendering and responsive behaviors for themselves before handover, not late into production. You’ll still be able to work with over 100,000 web fonts from the Fonts.com, MyFonts, Typekit, Google, Webtype, Fontdeck and Monotype libraries all under one roof—setting and styling type, comparing fonts, and fine-tuning your type systems. You’ll still be able to prototype detailed pages using our simple visual controls. All about the RWD? You’ll still be able to add media queries, refine your designs for various breakpoints, and test those behaviors in the browser and on devices. And you’ll still be able to output your designs as CSS & HTML in order to hand your developers an itemized spec for build. All of the features will be available for free, and every font in the collection will be at your fingertips and free to use for design purposes. Hello, this is the nice article about Typecast and best concept about it. Thanks for giving an excellent idea about web fonts.